I learned that it is easy to use and it has some awesome accessories that are easy to find. I like the ViviCam F128 Digital Camera! Easy to use and a different product for anything you need it for. Perfect size when you are on the go. I learned that they also make tablets. I learned that they make bathroom scales. I learned they have been in business since 1938. SLR Camera is something I love. Thank you for the giveaway. They make all kinds of stuff. I thought they just made traditional cameras! I had a Vivatar that was my Nana's over 40 years ago and used it for years. It was an old style 1010 film and it took the BEST pictures. I would really like to have a Digital Video Recorder, too. How easy it is to learn to use & amazing all the extras there r with these cameras now a days. Crazy !! This ends on my b day & would make an amazing prize to win.. THX!! I love the COLOR CORRECTION FILTERS FOR GOPRO that they make love to try using them. I like that you can have five profiles on the Camelio tablet. 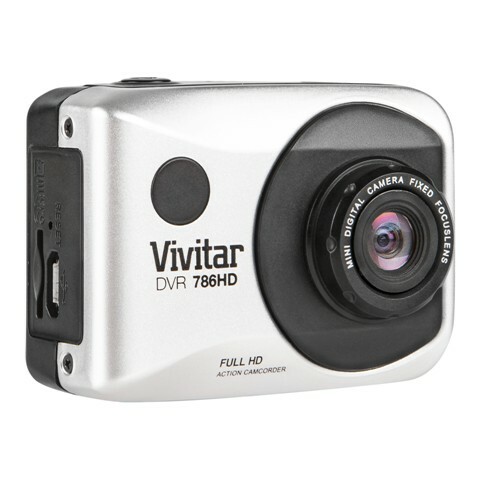 I also like the DVR 787HD HD Waterproof Action Camera. This would be great for when my husband and sons go fishing and for times at the beach and in the ocean. I learned they have a variety of products. This camera is small and perfect for on the go. I learned that the Camelio Android tablet has “Personality Packs” (sold separately). Personality packs allow users to customize wallpaper, widgets, lock screens, camera and photo editor and a themed bumper case. We have the XO tablet from the website and we love it! I would love to see how this compares to a gopro. I like the tablets by vivitar. I didn't know these cameras were submersible up to 30 feet! I like their wide range of cameras. I love the bathroom scale. I really don't want one but could use one. I didn't know vivitar made tablets, that is a nice piece of information. I learned that they had this kind of camera - my husband would love it!! Wow 1938. That is impressive. Oh I also really love their TEL-50600 Refractor Telescope! I love that it's waterproof how awesome! I learned that they make accessories for other cameras too. Vivatar is a good product to have. I have had two cameras from them in past and they last a while. Great accessories. I love the Camelio tablet. It's cool that you can customize and personalize the tablet up to 5 users. I didn't know about all the other products they make like telescopes, tablets, etc. I like the Color Correction Filters For GoPro 3/3+/4. The Camelio tablet looks very nice! I had no idea that they make Tablets. I'd really like the chance to figure out if I could integrate a tablet to an on the go camera. I love the awesome ViviCam F128 Digital Camera! Would love to win one. OMG! I didn't know this existed, so I learned a LOT!! This amazing camera has major megapixels!! This would be hours of fun and watching! I learned that Vivita has been in business since 1938. My son would like the TEL-50600 Refractor Telescope. I also like their RC-300-D700 LCD digital timer shutter release. I’ve been needed a shutter release for a while now for when I use my tripod and have long exposures. I like the Thai spa massage cushion and how easy they make it to find accessories for your camera make. I like the Camelio tablet -my husband's daughter has been wanting her own tablet and this one looks really nice. I was surprised they make telescopes and some other items. I learned they have many sizes of portable tripods to choose from. I plan on investing in one soon. I learned that Vivitar has more than just cameras and accessories. They have such things as bathroom scales, a tablet, and a massage cushion. This looks like a camera that is easily stored and I love the tripod. I am always the picture taker so now I could be in some pictures. I like the DVR 1020HD. That would be a great camera to have. I like the Camelio Tablet PC. I want the GM-8005 Thai Spa Massage Cushion on their site. I like theViviCam S325 Digital Camera. I love the XO Tablet. What a great tool for a young kid. They sell telescopes. I've been wanting one for the kids! I like the GS-7006 WirelessWeight Digital Bathroom Scale. I learned that they have been in business 1938. That says a lot for their products. I learned that there are 11 "outlets" listed where Vivitar products can be purchased. I like the camelio tablet too! It's so neat you can customize it with your favorite character! I didn't realize they had action cameras. I learned, and had no idea it was sold...Sakar International, Inc. is a 33-year old consumer electronics manufacturer. In 2008 we acquired the Vivitar brand, which has been in business since 1938. I had no idea they also made tablets! This camera looks super easy to use! Which is good. Was surprised they make Tablets too! I learned they have telescopes in their line of products! I learned that they sell tablets. Thank you for the chance to win! I love the variety of products and I love that this camcorder would fit my lifestyle of kayaking and hiking. I learned that they make the XO tablets.